OMG, I am lost for words…as soon as CJ said that this book would be written I was beyond excited, although you knew that this situation was totally all kinds of wrong, because of the emotional journey we had been on with Caleb and Livvie you could not help but root for them and you wanted them to get their HEA. Caleb had been living/existing on the dark side for so long it was really difficult for him to live as a normal human being. He tracked Livvie down and made it his mission to adjust for her, he wanted to give her the life she deserved but with him in it, she wanted that too but it was harder for him. He had used fighting and killing as a coping mechanism and without that in his life he struggled. I think that we forget just how he had been abused in the first place, he too had suffered the fate that was bestowed on Livvie before he came to her rescue, so he was also a Captive In The Dark but at a much earlier age. You could not help but feel for Caleb in this book, it was a hard adjustment for him and you could see that he was trying, Livvie had made a life for herself and had friends and school and things to do, he had nothing. He was not used to socialising and the way that his friendship with Livvie’s friends developed was heart warming, you see the thaw in Caleb and it was emotional to read. The course of true love never runs smooth and Livvie and Caleb have their ups and downs, it is a period of adjustment for both of them and they do eventually get through it together. This is just a beautiful story of how a broken man morphs from dark to light, learns how to live and love, with the love of a good woman anything is possible and whilst it may not be easy the benefit far outweighs the cost. Yes the book is emotional, you will probably leak some tears, but I didn’t really see this as the end, but rather the beginning. It could quite easily be a prologue into a new novel of what happens after Captive. I would love to see how they fare together in the future so maybe CJ Roberts could be bribed to continue their story. After all it is not a usual tale so it would be one of a kind. Fab story, loved it loved it loved it! 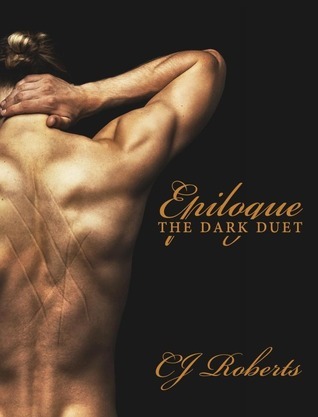 Like Donna, I was also so excited when I heard CJ Roberts was doing an Epilogue because I wanted to know what happened to Livvie and Caleb after the ending of SitD. Sure, he tracked her down and she didn't call the police, but what happened after? How do they get on now they aren't in the same situation. How can Livvie forgive Caleb after leaving her? I wanted these answers - I got them. I gave both Captive in the Dark & Seduced in the Dark 5 stars and although this book is very different it's definitely a 5 star book. "She hit me so hard my damn eyes were watering (I was not crying - eyes water. I think we all know I'm a badass and I don't cry) "
"wait until you get inside. Its my favourite part." And yes, gentle readers, I am that f#*king smooth"
They have a lot they have to get past in order to move forward and I love the fact that Caleb mentions its quite sick how after everything he's done Livvie loves him. "I am the man who kidnapped Livvie. I am the man who held her in a dark room for weeks. I am the one who tied her to a bed post and beat her. Im the one who nearly sold her into sexual slavery. But, most importantly, I am the man she loves. She loves me. It's quite sick isn't it"
That's how I felt about loving Caleb's character through the first two books, It felt like it should be wrong, but in this book you see a totally different side to Caleb and you don't feel like that at all! I said this book is different and it is. As Donna says you have still got parts of Caleb, but he's not the same, you feel him actually turning into a different person, into James. It is a difficult journey for him to go through, but a fascinating one. Livvie has changed a lot too and by the end of the book it did seem like I was reading about two different people. I agree with Donna this book feels more like the beginning of a story than an end. Although a far cry from what we are used to from The Dark Duet books, I loved it and would love to read more about Sophia and James and Claudia and Rubio.